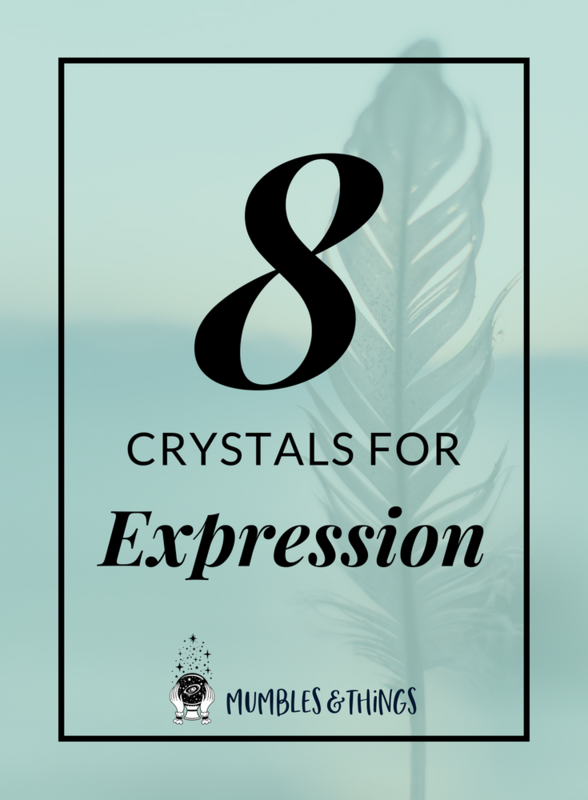 Within this blog post you will find a list of eight crystals you can use for helping you to communicate more effectively and speak your truth. Each of these is also associated with the Throat Chakra. The fifth chakra, also known as the throat chakra, is in the front of the neck, in the V of the collarbone. It rules speech, self-expression, communication, creativity, the arts, and speaking your own truth. If you've ever felt powerless or unable to speak your mind your throat chakra might be out of balance. 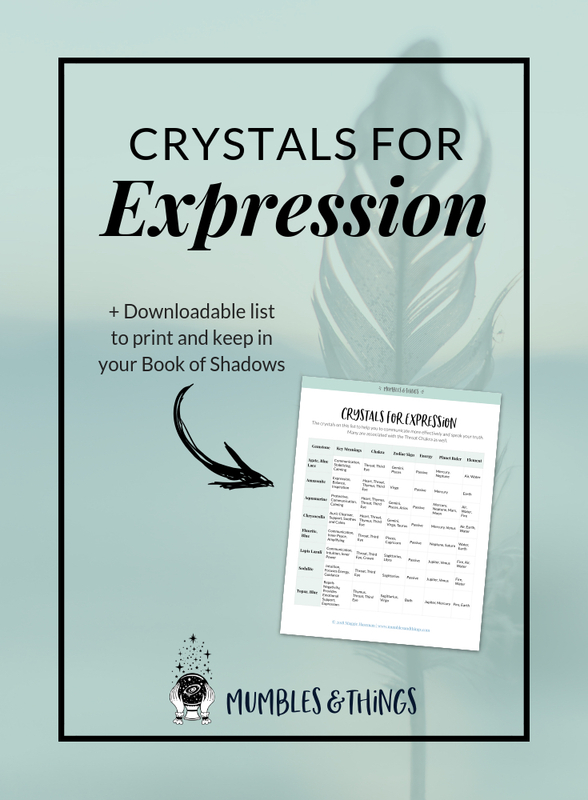 Many people store anger in this chakra so many of the crystals on this list can be beneficial for letting go of that anger to lead you to positive change and transformation. Color is a good place to start when looking for crystals to help you balance and open the chakras. The color often associated with this chakra light blue. Below you will find a list of eight options you might try. Lapis Lazuli quickly releases stress, bringing a deep peace. It possesses enormous serenity and teaches the power of spoken word. This stone harmonizes the physical, emotional, mental and spiritual levels resulting in a balanced sense of purpose and self-awareness. Fluorite is one of the most colorful minerals known. It is called the “crystal of discernment and aptitude” bringing the energies of responsibility and intuition. Blue Lace Agate is known as the “Stone of Ecology” because of it’s resemblance to the Earth from outer space. It calms the mind and emotions and gently opens and expands your consciousness. Full of calming energies, Aquamarine reduces stress and quiets the mind. It harmonizes its surroundings and protects against pollutants. This stone calms the mind by removing extraneous thought. It sharpens the intellect, and clears up confusion by filtering the information that reaches the brain and clarifying your perception of your surroundings. When used with the throat chakra, Blue Topaz can aid in verbalization. It can help you attune with your higher self so that you can live according to your own aspirations. It helps you to recognize where you may have strayed from your own truth. 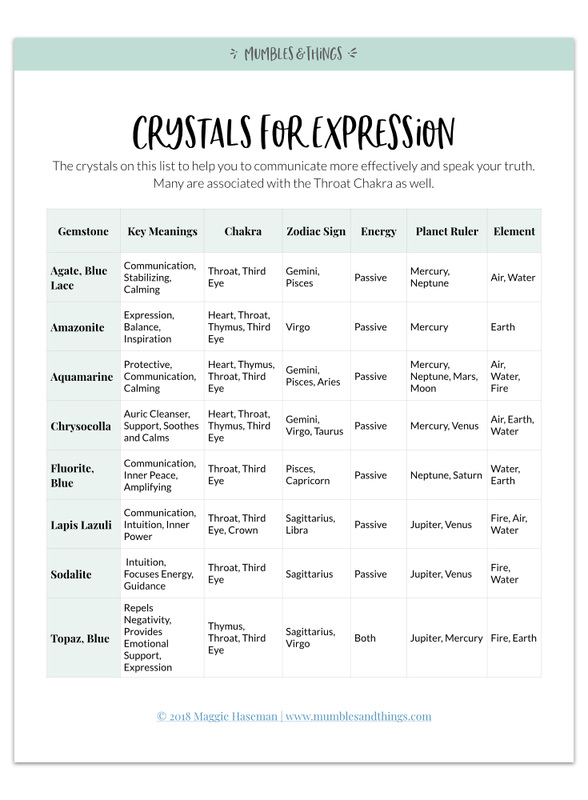 What stones do you use for expressing yourself and working with the Throat Chakra? Tell me about it in the comments below.